It is getting cold and there are some really nice coats appearing! The Topshop ones are a little more than I would like to spend so I am hoping some cheaper versions appear in the likes of Primark and H&M. I tend to stick to dark or plain colours when it comes to coats, and use bold colours in what I wear underneath, but I do love this pink coat, it's just adorable! Can't decide which one is my favourite, what do you think? P.s. I know the gilet isn't a coat but I like it. 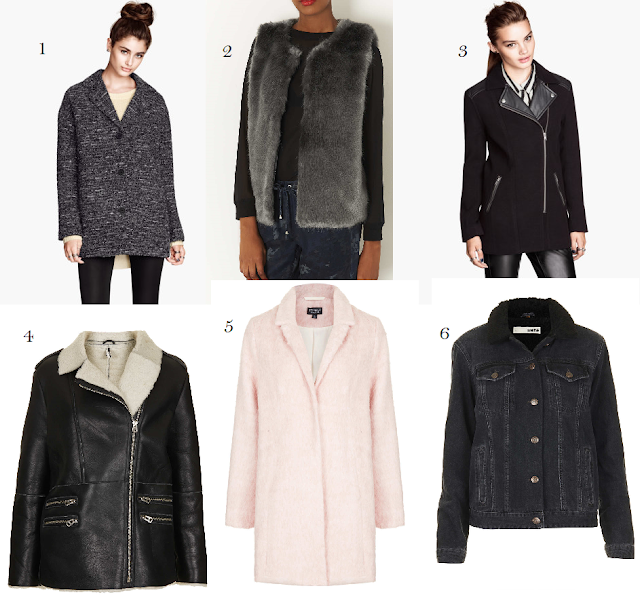 Thaaaank you for this post I've been lokking for a boyfreind-ish grey coat and the first one is perfect! Love your style and adooore your blog! And thanks for the comment! I love the topshop pink coat, so so pretty, but yeh it is a bit pricey! It's Spring in Australia now, so we've just put away all our coats and jackets! But we really do like the 1st and 3rd one.